St. Jerome (c.340-420) is most famous, as a writer, for having made a new translation of the Bible (the Hebrew Old Testament and the Greek New Testament), into Latin, which was used throughout the Middle Ages and beyond, and was the basis for many translations into modern languages. This manuscript was written at the Cistercian Abbey of Coggeshall, in Essex. This elaborate initial 'H' introduces the prologue of a text by St. Jerome concerning Christian authors. The uppermost and lowermost edges of the leaves are guides to the rubricator, but the rubrics have not been supplied. 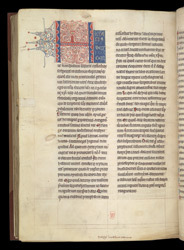 To the left of the initial is a guide to the artist, who supplied the opening words of the text in white on a panel of blue.